Bhagyalata Sahu (44 yrs), a single woman from Mundamarai, Ganjam had never thought of getting a homestead land under land rights. Neither she is aware of any rights nor about any entitlements. The effort of local administration as well as the mobilisation of ActionAid could lead to title of homestead land for her. It was also a dream for SajaniPrusty andJhunu Sahu of the same villagewho have been given title of land.But there are lakhs of single women in the state who have not only been denied their land rights but also are being sidelined from developmental benefits as well as entitlements and rights. “Being visually impaired, I used to think that I could not do anything for my family. But now I have a piece of land of my own. This gives me great relief and hope.” Said Jhunu Sahu, Mundamarai, Ganjam. Similarly, Ms. SajaniPrusty said “I am here to fight for the rights of single women because they are one of the most vulnerable group in India today,”. 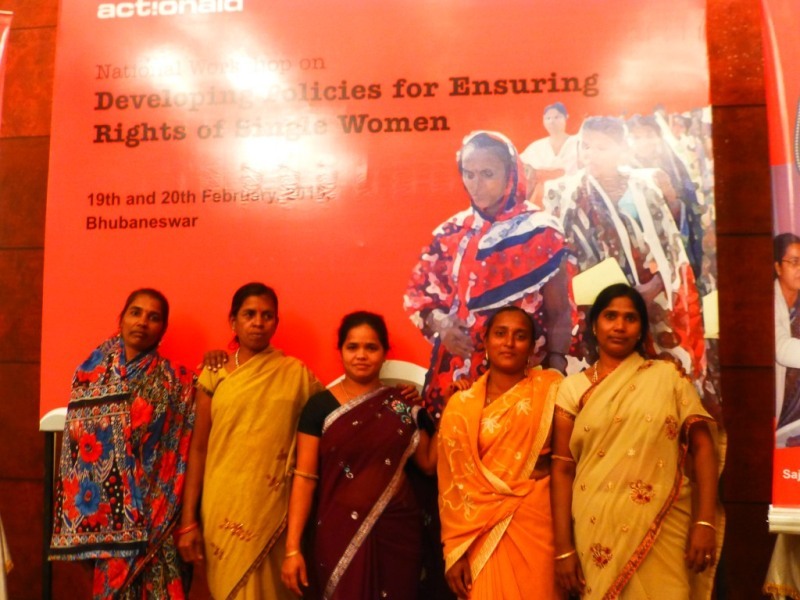 Women like Bhagyalata,Jhunu Sahu, MeeraBehera and SajaniPrusty from across the country were here on a two-day convention that was held to recount their stories of struggle as a single women and fighting for their rights. Enumeration and disaggregated data is key to institutionalize any women specific entitlements and our policies must make an inclusive approach and define single women to ensure their rights as it is evident that divorced, separated, deserted and unmarried women are treated the worst in society, said Mr. Ghasiram Panda, Programme Manager, ActionAid. Eminent Women rights Activist Dr. Binni from EkalNariSakti Sangathan, Jharkhand said that single women are more marginalized in our society and there are deliberately designed social stratification exists that influences actions to take away single women from the mainstream. 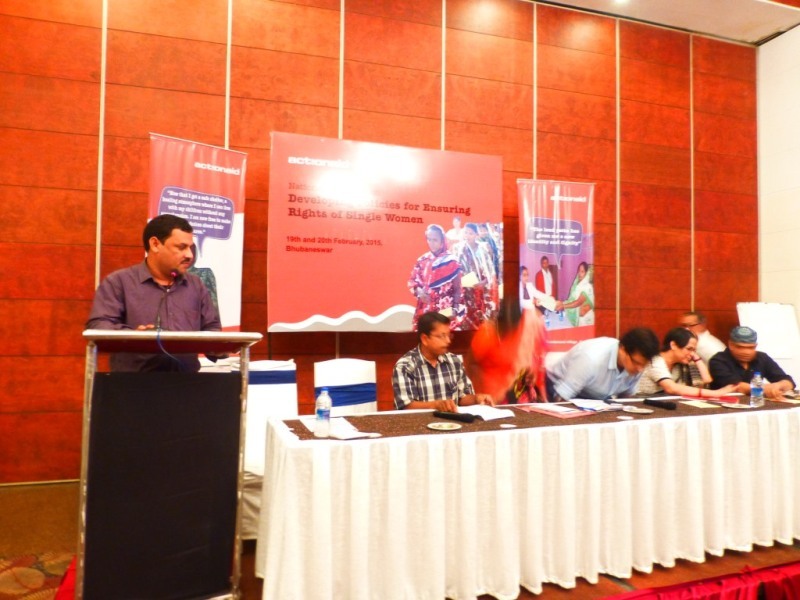 In this context, ActionAid undertook a study in 11 Tehsil of Ganjam district to understand issues affecting women in general and single women in particular on land rights and identified nearly 80000 single women in the district. The study also reveals that identification of single women as eligible for homestead land is a challenge due to lack of policy guidelines. The administrative structure and mechanisms have to be better clarity on definition of Single women said Dr. Amrita Patel,Project Advisor, State Resource Centre,W& CD department, Govt. of Odisha. If we take note on the data on the Census of 2001, 7.4 percent of the female population of India are single. There were 3,43,89,729 widows in India and 23,42, 930 divorced/separated women in our country. Again a report of NDTV in 2011 reveals that there are 42 million women who are widows. The Planning Commission has also proposed special dispensation for single women, particularly those who are single by choice, under various government schemes in the 12th Five Year Plan. The United Nations Commission on Human Rights vide its resolution 2003/22 on Women’s Equal Ownership, Access to and Control over Land and the Equal Rights to Own Property and to Adequate Housing states that there is a need to promote women’s access, ownership and control of productive assets, property, land, and inheritance rights recognising that women face multiple forms of discrimination. The Protection of Women from Domestic Violence Act (PWDVA) 2005 covers those women who are sisters, widows, mothers, single women, or living with the abuser amongst other aggrieved women. The adoption laws have identified single men and women. The Hindu Adoption and Maintenance Act, 1956 (HAMA) specifies that Married couples or single adults can adopt; A single man or woman can adopt; A single man adopting a girl should be at least 21 years older than the child; A single woman adopting a boy should be at least 21 years older than the child. Guardians and Wards Act, 1890 (GWA) states that Single people can adopt without any age difference restrictions. Juvenile Justice (Care and Protection) Act of 2000, amended in 2006 (JJ Act) Single people can adopt. In collaboration with the District Administration of Ganjam, ActionAid has have ensured distribution of title 2179 in 7 tehsils of Ganjam Districts, out of which 2170 have already taken physical possessions of land. The continuous engagement of the Women’s Action Group with the district / tehsil revenue administration and challenge created in the aftermath of Phailin cyclone towards rehabilitation of the affected population geared up the things.The detailed database that was created in the process of our Land Rights Work in Ganjam is being referred in all the purposes by the District Administration including rehabilitation in post Phailin scenario. The two days’ workshop was attended by Dr. AurobindoBehera (I.A.S) , Dr. Madhumita Ray, Women’s Rights Activist, Mr.Sanjay Pattnaik, Country Director, Landsea.Mr.Ravi S.K., Senior Programme Manager, ActionAid, Kishor Kumar Mishra, Tehsildar, Buguda Block, Ganjam, Dr. Deepa Prasad, State Programme Coordinator, UNFPA, Ms. SashipravaBindhani, Women Rights Activist, Mr.Byomkesh Kumar Lal of ActionAid and called for a more inclusive and comprehensive space in the policy should be created for single women in ensuring their rights .